WOOL ZONE is a concentrated acidic neutralizing agent used in the final rinse of the extraction cleaning process for wool fibers. Laboratory tests demonstrate that Wool Zone rinses out soil and residue better than conventional acid rinses or water alone. 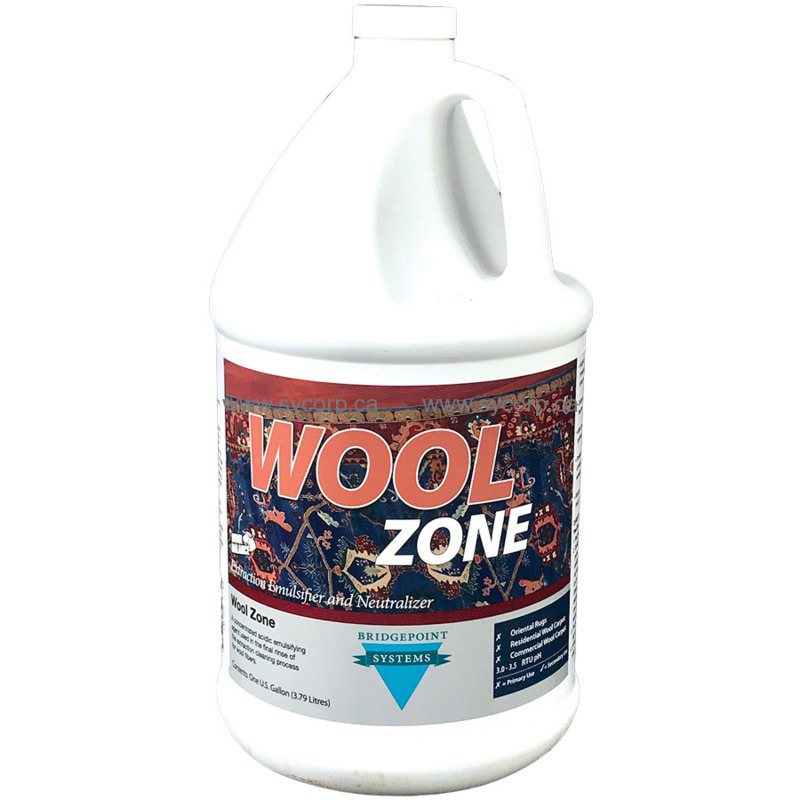 Wool Zone is designed to work in conjunction with a compatible pre-spray, like Wool Perfect. Multi-functional as it stabilizes dyes, works to prevent browning and yellowing, pH neutralizes the carpet, limits re-soiling and leaves a soft luxurious feel. Unique as it uses proprietary acidic rinse agent that has been used to scour wool during wool processing. Safe and effective for all water safe natural fibers and synthetic fibers. Protects your equipment as it contains two special corrosion inhibitors to protect any metals in your extraction equipment. Works effectively with any type of extraction equipment – truckmounts, and portables. 1. Read entire label before using. Use only as directed. 2. Carefully pre-inspect the rug, fabric, or carpet before proceeding. Identify fiber content, construction, dye stability, shrinkage considerations, and preexisting damage. Always test every rug. fabric or carpet for dye bleeding potential in an inconspicuous area. Carefully look for conditions which could contribute to cleaning related challenges such as pre-existing pet urine, water damage, fiber deterioration, past cleaning residues, and fringe discoloration. 3. The preferred method for cleaning investment textile rugs is in-plant. a. Make sure there is adequate airflow for drying and ventilation. b. Adequate and safe work area where you can safely move the required cleaning equipment and tools around and the rug can be safely cleaned on the floor without causing damage to or from other surfaces which might bleed color when moist or wet. 5. Prior to wet cleaning, remove as much dry soil as possible from the rug utilizing a vacuum (with a beater bar), portable rug dusting unit, compressed air system, or automated duster. Follow equipment manufacturer directions. Portable extractor: Mix 2 ounces of solution to five gallons of water (1:320) in extraction tank.